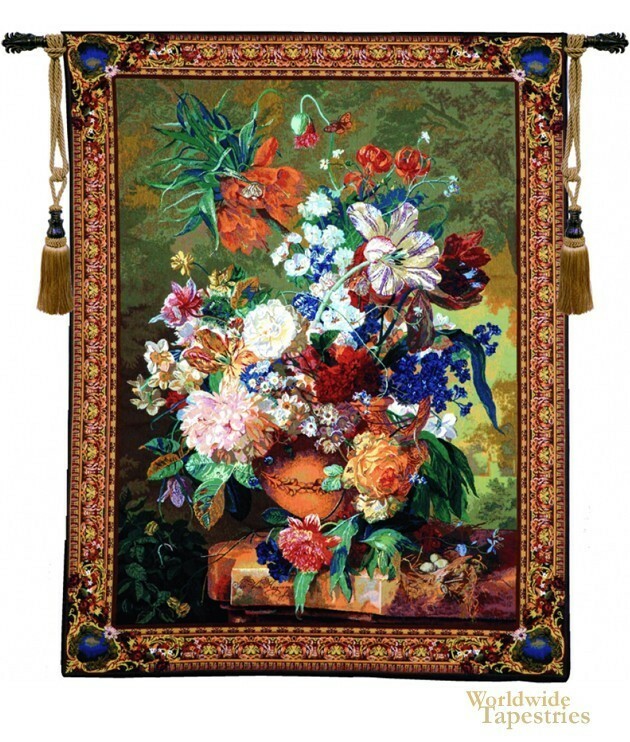 The Terracotta Floral Bouquet tapestry from Belgium is based on the art of Jan van Huysum from 1740. In this masterful work we see an incredible display of flowers including peonies, roses and liliums of an extraordinary array of colors which blend to create an impressive visual feast. We see the colors arranged in the masterful way of Huysum, among the copper vase and butterflies. Jan van Huysum was a Dutch master painter and focused on flower still lifes and landscapes of nature and ruins. Here we see his ability to create a lush work that accentuates the beauty that flowers and nature can bring to any scene or room. This work was commissioned originally for the Duke of Mecklenburg. His originals are now shown in the Louvre in Paris, Berlin, Amsterdam, St Petersburg, Munich, Hanover, Vienna, Boston and Copenhagen among other places. An elaborate floral border completes the work. The combination of textures and patterns in the petals are used to create a balanced and visually stunning work. The Terracotta Floral Bouquet tapestry is backed with a lining and a tunnel for easy hanging. Note: tapestry rods and tassels, where pictured, are not included in the price.